John Caisse 72 year old white male, 6' 7", 126 lbs., gray/brown hair, and brown eyes. Last seen wearing a cream thermal long sleeved shirt, beige cargo shorts, and white shoes. Last seen in the 400 block of S Calle Encilia Rd. Palm Springs, Ca at 11:30 a.m. Subject has dementia, Alzheimers, and gets confused. If you have information that can assist in helping safely locate John Caisse please call 911 or contact PSPD at 760-327-1441. 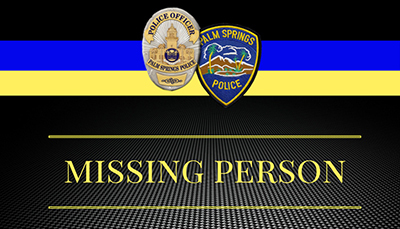 If you have information that can assist in helping safely locate (Missing Person's Name), please call 911 or contact PSPD at 760-327-1441.